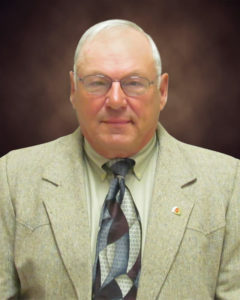 LeRoy Littau, Carter, has been elected as a delegate to the 135rd Annual American Angus Association® Convention of Delegates, Nov. 5 at Columbus Convention Center in Columbus, Ohio, reports Allen Moczygemba, CEO of the American Angus Association. Littau, a member of the American Angus Association with headquarters in Saint Joseph, Mo., is one of 329 Angus breeders who have been elected by fellow members in their state to serve as a representative at the annual meeting. Representing 44 states and the District of Columbia, the delegates will participate in the business meeting and elect new officers and five directors to the American Angus Association board. The annual meeting will take place in conjunction with the 2018 Angus Convention, Nov. 3-5, in Columbus, Ohio. The event is open to anyone in the cattle business and will feature high-profile keynote speakers; educational sessions, including thought leaders from every industry sector; the International Genomics Symposium, sponsored by Neogen GeneSeek operations; Angus University, sponsored by Merck Animal Health; entertainment; evening galas; prize giveaways; and an expansive trade show. Visit www.angusconvention.com to learn more or to register. With school now is session motorists are reminded to slow down in school zones. The speed limit is school zones is 15 miles per hour. The Winner Police Department is patrolling around the schools to make sure everyone is safe. There are more kids riding bikes to school and also more children in the crosswalks so motorists are advised to be on the look out for children. Winner High School competitive cheer and dance competed in Gregory on Saturday. The dance team placed second in pom and third in kick. Platte won the overall and Dakota Valley came in second. The Winner Area girls placed third in competitive cheer. There were six teams in the event: Gregory, Winner, Platte-Geddes, Bon Homme, Wagner and Dakota Valley. “I was super happy with how the girls competed,” said coach Val Ewing. It’s always nice to get that first competition out of the way and for them to work out their nerves,” said Ewing. “Add to that having to change a lot of things the morning of the meet without getting to practice and not having a main flyer, the girls did the best they could,” noted the coach. The Winner girls practiced Friday and one of the flyers hurt her knee and did not compete on Saturday. Coach Ewing explained this meant having to rearrange a lot of things the morning of the competition. She said the girls did a good job of adjusting and being moved to different spots. Winner area competes next in Winner at their home meet on Sept. 8. The coaches would like to see the stands filled on that Saturday and support the cheer and dance teams. Keely Bertram, a senior at Black Hills State University, is one of 56 BHSU student-athletes named Division II athletic directors association academic winners for 2017-18. 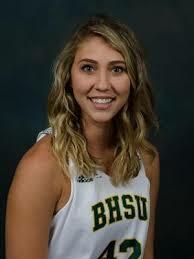 Bertram plays on the BHSU women’s basketball team. She is the daughter of Rahn and Maria Bertram of Colome. Bertram just stated student teaching at Creekside Elementary in Spearfish. She will play her final year of basketball this year. In order to receive the award, a student-athlete must have at least a cumulative 3.5 grade point average while having attended at least two years of college and also participated as an active member of their intercollegiate team in the last year. In 2016-17, Bertram played in 16 games with eight starts. She grabbed a season and career high four steals against Adams State. She was named to the academic All-RMAC honor roll. 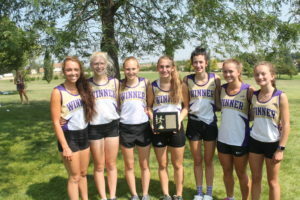 Winner area girls cross country team took first place at the local Winner Invitational on Friday. Sidda Schuyler won first place in 20:58.60. Saige Schuyler took third in 22:38.35. Also placing for the Lady Warriors were Melanie Brozik, 5th, 24:07.49; Jaclyn Laprath, 6th, 24:45.20; Meagan Blare, 7th, 24:49.16; Aryn Meiners, 9th, 25:06.71; Madison Thieman, 11th, 25:28.34. In the varsity boys, Kade Watson placed 5th, Wyatt Turnquist, 8th in 20:04.50. Joseph Laprath placed 15th in 22:20.20. In the junior varsity boys, Konner Osborn placed first. The next meet for the Winner Area team will be Sept. 4 at Scotland. 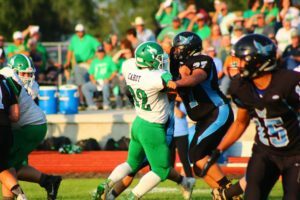 On Friday Aug. 17, night, high school football season kicked off in South Dakota for all three nine-man classes and class 11B. It’s always said that records are meant to be broken, and that nearly happened opening night when Colome hosted Centerville. The theme of this game was lots of scoring… for the Cowboys that is. Coach Ben Connot’s Cowboys were victorious 72-6. Yes, you read that correctly, Colome scored 72-points. And it to make it even more impressive, all of the scoring occurred in just the first half. For Class 11A, 11B, and all three nine-man classes, there’s a mercy rule. If a team has a lead of 50-points by the end of the first half, or if they secure a lead of that magnitude in the second half, the game is over. Colome’s 72-point performance didn’t break a record but it came close. In South Dakota nine-man football history, Avon has the record for the most points scored in one half of football with 76. That record occurred in 2004, and it was a season that concluded with Avon winning the Class 9A State Championship. Cowboys head coach Ben Connot said he’s proud of the way his team played to open the season. He mentioned the importance executing plays, and how preparation in practice correlated over to game day. Colome is currently ranked No. 3 in the South Dakota Media Preps High School Football poll, behind only Sully Buttes (No. 1) and Castlewood (No. 2). With the Cowboys football program receiving well-deserved respect from around the state, Coach Connot is keeping his team focused. Colome football team defeated Tripp-Delmont/Armour/Andes Central/Dakota Christian 54-6 Friday in Armour. This was the second victory of the season for the Cowboys. They exploded for 48 first half points. Scoring for Colome in the first quarter were Jaikob Week on a 9 yard run, Week on a 24 yard run, Chase Dufek on a 63 yard run. In the second quarter, Jackson Kinzer scored on a 28 yard run, Calvin Ringing Shield on a 22 pass from Kinzer, Riley Shippy on a 7 yard run and Layton Thieman on a 32 yard pass from Kinzer. In the 4th quarter, Shippy scored on a 45 yard run. Kinzer completed 7 of 9 passes for 140 yards. Dufek rushed for 118 yards and Ringing Shield had 61 yards. Defensive leaders were Jacob Beckers and Jaikob Week with 5 tackles. Michael Supik and Thieman had interceptions. “I thought defensively we played very well,” said coach Ben Connot. “We were able to take away their best player and forced him to be uncomfortable. When we had chances to make plays on both sides of the ball we capitalized and made big plays happen,” said Connot. Colome plays at Burke in Aug. 31. Winner High School football team scored 44 points in the first half on the way to a 50-7 victory over Stanley County Friday night in Winner. This was the home opener for the Warriors which saw a great crowd follow the team. Winner scored 14 points in the first quarter and 30 in the second quarter. Trevor Peters opened the scoring for the Warriors on a 15 yard run. Six minutes later quarterback Brady Fritz completed a 54-yard touchdown pass to Brandon Volmer. To start the second quarter, Fritz went to the air again and completed 34 yard pass to Joren Bruun. With 9:42 left in the first half, Fritz threw a 37 yard TD pass to Nolan Sachtjen. Peters scored his second touchdown on a 23 yard run with 4:47 left in the second quarter. Capping the scoring in the first half was Sachtjen on a 21 yard run. Stanley County scored in the second quarter. The final score for Winner was in the fourth quarter on a 16 yard run by Aaron Gilchrist. Aaker said Fritz threw the ball well. The quarterback was 4-4 for 151 yards. “Brandon Volmer, Joren Bruun and Nolan Sachtjen all made some nice catches,” said the coach. Winner had 407 yards of total offense and held Stanley County to 154 yards. Winner had 21 first downs and their opponent had 8. 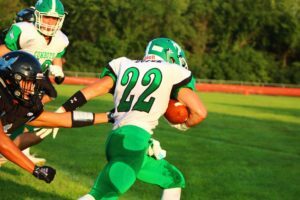 Peters was the leading rusher for the Warriors with 92 yards followed by Sachtjen with 36, Sam Kruger, 29. 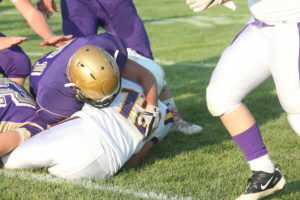 The Warrior defense was led by Shea Connot and Phillip Jorgensen with 5 tackles each. Elijah Blare had 4 tackles along with Preston Norrid. Everyone got in the game. The second half the junior varsity played and the coach complemented them for how well they played. The Warriors will host West Central on Friday at 7 p.m.
Last year the Warriors defeated West Central on the road. Aaker says West Central has a great program, well coached and very disciplined. “This will be a big challenge for us and we need to be ready,” he said. Winner High School volleyball team opened the season with two wins. 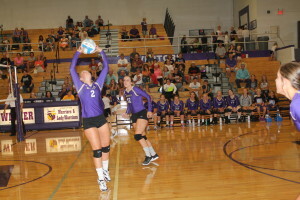 The Lady Warriors defeated Bon Homme on Aug. 21. The scores were 25-19, 25-13 and 25-13. Alexis Richey and Gracie Littau each were 100 percent in serving. Ellie Brozik had 5 ace serves, Richey and Kalla Bertram had 2 each. Morgan Hammerbeck had 14 kills and Abby Marts and Brozik had 4 each. Mackenzie Levi had 17 set assists. Brozik had a 2.33 serve receive rating and Richey 1.77. Hammerbeck had 15 digs, Richey 12. Marts had 3 block assists. As a team, Winner was 87 percent in serving with 10 aces, 26 kills, 25 set assists. The team had a 1.78 serve receive rating. The team had 46 digs and 3 blocks. “We came out a little nervous,” said coach Jaime Keiser. “Once we got the nerves out we did a great job of attacking the ball which kept Bon Homme on the defensive end. We were serving aggressively and getting in defensive position. We did a great job of talking and working together as a team,” said Keiser. On Thursday, the Lady Warriors defeated Miller. The scores were 25-15, 26-24, 22-25 and 25-21. Scoring leaders were Gracie Littau and Alexis Richey with 100 percent in serving. Brozik had 4 aces serves and Richey and Hammerbeck, 2 each. Hammerbeck and Marts each had 13 kills. Levi had 27 set assists and Littau, 4. Richey had 19 digs, Levi, 14 and Littau, 12. Marts had 1 solo block and 2 block assists. Levi had 2 block assists. As a team, Winner was 92 percent in serving with 10 aces serves and 38 kills. They had 33 set assists, 73 digs and 4 blocks. Keiser said the team came out focused and ready to play. “We were very aggressive serving which kept Miller out of system. We were getting in defensive position and playing very well as a team. We did a great job of keeping Miller’s best hitter in the back row. “It was a total team effort and everyone stepped up and did what they needed to do to win,” said Keiser. The Lady Warriors are at Ainsworth, Neb., on Aug. 30. On Sept. 4, Winner will host Bennett County and Gregory. 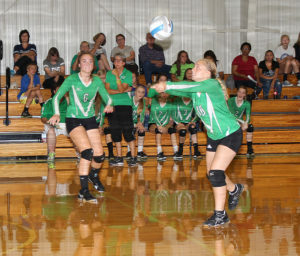 Colome volleyball team opened the season at Burke on Aug. 25 and lost the first match. The Cowgirls lost 7-25, 24-26, 19-25. Serving leaders were Haley Krumpus, 8 points, 1 ace; Kaydee Heath, 5 points, 1 ace; Makayla Shippy, 4 points. Kill leaders were Kaydee Heath, 5 and Rayne Hermsen, 3. Kaydee Heath had 2 solo blocks and Saydee Heath had 1 solo and 1 assist. Kaydee Heath had 4 digs and Krumpus and Hermsen, 3 digs. The C team lost 22-25, 21-25. Serve leaders were Libbie Petersek, 11 points and 3 aces; Ashlyn Hoffine, 6 points and 1 ace and Devon Dougherty, 6 points and 2 aces. The junior varsity lost 11-25, 20-25. Serve leaders were Dougherty, 5 points, 1 ace and Clarissa Ringing Shield, 4 points. The next action for Colome is the Gregory Invitational on Sept. 1.